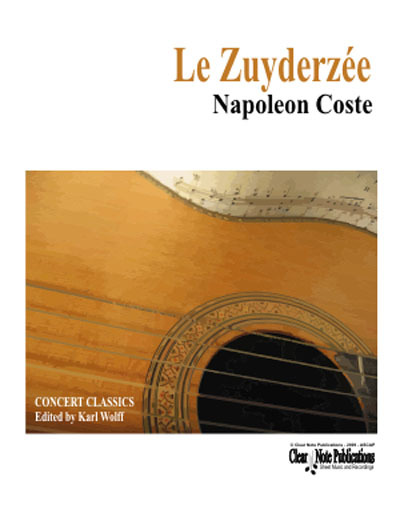 Le Zuyderzee written by Napoleon Coste, who was born in the village of Amondans in France on June 27th, 1805, is from his collection of solo works entitled Souvenirs Book II. A work originally written for the seven string guitar, represents Coste's departure from the more established style of sonata form prevalent in the classical era to more romantic pieces that represent his impressions of the locale after which they were named. Coste's use of an additional low seventh string that was often tuned to D, added some depth to the range of his instrument. It also allowed for variations in fingerings of some bass notes. I've played these works on both six and seven string guitar without much difficulty. The bass lines are not very complex, this allows for both standard tuning or drop D tuning on a six string and on seven string they're even easier to play.